Oh look, look at the article! You see it, right? 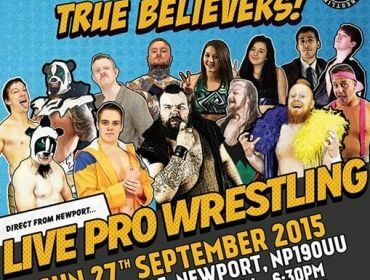 Yup, it’s another Dragon pro Wrestling review! And unlike the last show, I was able to see this one live, being there to help set-up the ring for the show and everything. I won’t talk too much about that aspect since this is about the show and not my experiences in training, those would be for other articles. But I should say for future reference to myself that helping everyone out with the show was a great thing. Loading up the van with the ring equipment, unloading and setting it up, re-loading and taking back at the end of the show; and even the in-between training session before the show started. It was all such a great experience and hopefully this is something I get to do for a while longer. For the actual turn out, it did fairly well – most of the seats were filled, mostly with a mixture of adults and their kids. All I saw were kids in my section however as I sat with someone who I trained with on the day too – he helped me out with the time of the matches as well, so thank you making my review somewhat more professional butty. As if it was anyway to begin with. But yeah. This opening match was definitely an eye-opening way to start the show, maybe not for the reasons you’d expect. Unless you like the sight of men in tights grappling each other in weird ways.. oh wait, I just explained the entire concept of wrestling there! What I mean is that you haveKapow’s own “Mr. Massive”, Chuck Cyrus, coming out in the brightest shade of pink clothes. With muscle flexes, and then you have “The Exotic” Scotty Essex. Now in the past, he’d usually come out in the usual Essex attire. Pink and white tights, pink feather boa, you know the norm. But he brought up an eye catching flare with some guy liner, pink coloured hair, and blue glitter eye shadow. Of course Cyrus attacked Scotty during this and the match started from this point on. I would have been so baffled being a kid in the audience though!? Throughout we had Chuck showboating during his manoeuvres, doing different exercise taunts in-between and doing his best to keep the Dragon Pro regular down. He even ended up breaking the ropes after tossing Essex at them halfway during the match. Luckily the ring crew was on hand to fix this small issue while Chuck did his usual taunting and beating down on Essex. Scotty remained strong and managed to bring enough of a comeback to eventually score the tactical pin reversal from Cyrus’ Jackhammer attempt. After the match was over, the newly renovated Scotty was so happy that he even brought in a young fan from the crowd to pose with him in the ring. Ian Williams the third appeared for the crowd claiming that since he was here tonight and that fellow Dragon Pro star Bishop would be having an Open Challenge soon, he would make one for himself. He called on ANYONE from the back to accept his challenge; and accept it he did as he had the awkwardly delightful Shannon Nicole before everyone, furry dinosaur backpack and all, wanting to accept the former Dragon Pro champion’s challenge. Inter-gender action? What an interesting thing to happen. Sadly Ian wasn’t too much pleased and tried to push her aside, but she insisted she wanted to face him and even wanted to give him a John Cena action figure as a gift of friendship. But this angered him more than anything, so he attacked her and the challenge began. This match was your regular Bully/Victim story played by Ian and Shannon respectively as while Shannon tried to show her equal might against the former champion, she would keep getting knocked down and beaten around doing so. One point of the match had people gasping as Ian delivered a running dropkick to the cornered Shannon RIGHT IN HER FACE! Seriously, it was like she got hit in the head with a bullet the poor girl! I mean I?d be dazed for a long while if that happened to me, so how she managed to keep fighting was a true showing of willpower. Things soon got personal when Ian rummaged through Shannon’s bag and ruined the things inside of it. Stamping on her Cena figure, ripping up Shannon’s comic books, and he even attempted to rip the head off of her dinosaur bag, the monster! This turned Shannon from a sobbing mess to an enraged vixen as she soon evened things out with Ian and won the match after countering an Attitude Adjustment from Ian (because that Cena hype) into a pin fall situation which she got the win from. This match was very fun; however personally, I am somewhat disappointed that this wasn’t an actual women’s match instead of an inter-gender match. Granted it was still very good, but unless you count the diva like antics of mister Williams, I don’t think he would count as one of the girls of Dragon Pro. Now for the original scheduled open challenge match. This was a fair tame match compared to what he has seen so far. Sir Hyde kept holding Bishop down, flaunting off his ‘royalty’ to the audience every chance he could, as well as used under-handed tactics with most of his moves. Bishop wouldn’t have much of this though as he got back in Hyde’s face and beat him to a pulp with powerhouse and heavy hitting manoeuvres. He won the match by pin fall after delivering an impressive Gunslinger Slam. Another Bishop match, another Bishop won. He’s definitely one to look out for in future shows. Now before the next match began, Pariah Khan came out alongside Kalliban aka “Killer Karan” or Killer Kharan, how many names will this guy go through? Hopefully this one sticks. Anyway he talks about how Kalliban and he are getting screwed by Mike in favour of those who come from the Dragon Pro Academy despite mentioning how Kalliban has always been impressive since day one. He claimed he would do a better job at running Dragon Pro Wrestling and wanted to fight for it. He would even be willing to face Mike in a singles match if he would lose, just to up the ante, but he knew that would never happen. So after this the match began and once again, it was one of the more heated matches of the night due to the rivalry these men have had for the last few shows – neither would hold back against the other between their brutal brawling and their ever impressive manoeuvres and submissions, it could have gone either way; I mean Kalliban even pulled out a Killswitch/Unprettier/Impaler at one point, so for me personally, that’s one of the few things I dislike about him. In the end I think it was the crowd support that got Mike through this match with kids and adults alike rallying him on to get the win after a “Gotch Style” Cradle Piledriver./ But after he had beaten Kalliban, he wasn’t done, as he wanted to fulfil Khan’s end of the bargain and have a match with him. And since he owns Dragon Pro still, you can’t really say no to the person who runs the show now can you? Before the match started, Kalliban tried to ambush Mike again, but he saw it coming and managed to damask the Killer Kalliban and he ran to the back protecting his face as much as he could. Now I’m sure you can guess what happened next. Khan got his shirt ripped off, he took good dozen or so hard chops to the chest from Mike and he hits him with another Cradle Piledriver for the win, and as expected, the people were all over this. Next we had an intermission for a good twenty minutes or so and I used this to basically get a breath of fresh air since it was started to get quite stuffy in the building. I also saw how the other Academy members were doing with the show and they said that there weren’t many problems other than a few kids being annoying. But hey, kids are annoying by nature, can’t really help that. Kids be kids, whether we want them to be or not. Team Dragon Pro (Panda Mask, Panda Cub & Morgan Webster) defeated Team Kapow! (Kelly Kakrot, Owen Wall & Technico Supremo) via pinfall. The one who was originally announced as “Terror of Tijuana” El Hijo Del Poltergeist, ended up turning out to be a familiar face in “Flash” Morgan Webster, a nice surprise that I should have expected, considering he helped train everyone in training today. The action after intermission instantly picked up with one of my two picks for match of the night, possibly the pick by a slight edge. This match was fast paced from start to finish, even the bigger guys of both teams were moving out, pulling out flashy moves as effective as their other tag team members. One spot close to the end had me and other in the crowd in a scare when Panda Cub flipped outside and hit his legs right on the guard rails. It was painful enough to see, I can only imagine how he must have felt doing it. But this matches action was the thing that had be hooked to the match even in my half dozed state. The team dynamics of the Pandas, the ever growing arsenal of moves from Cub, the heavy hitting and also risking taking style of Panda Mask, and also the usual yet always impressive speed striking style of mister Webster. Team Kapow also had this dynamic with all of their guys as well, even having some Dragon Ball Z references incorporated into moves from Kelly Kakrot (implied by his ring name and also the fact that was dressed as a Goku influenced character design). The match came to a finish after a Frog Splash hit from Panda Cub getting the pin fall victory for his team. This match was a must see honestly, it had a little bit of everything in it that left everyone who saw it happy by the end of it. Pure Breed (Jezz Gardner & Matt Horgan w/ Merlin Cambridge) defeated Cal Adams & Prince Awatar via disqualification (8:34). This match was one of the most interesting ones that I really wanted to see since it featured both talent that trained at the Dragon Pro Academy, and also faces that either hasn’t debuted yet or people that don’t get as much time on the shows. This match was honestly my second favourite of the show and I was quite surprised by how well it went. Cal and Awatar were the instant crowd favourites despite this being their first appearances for Dragon pro. Awatar even had a few hand-made signs from crowd members, something no one else had that I saw. If that isn’t telling enough, I’m not sure what is? Despite their still sour attitudes, Jezz and Matt worked well together as a team and proved that they have an honest place in the Dragon Pro tag team division, while Cal Adams, even though he got a lot of the offense on him in the match, made a strong claim as to why he’s pencilled in as one of the top rookies of 2015 for Dragon Pro. But the real star that came out of the match, for better or worse, was Awatar. As from the get go, he tried to involve himself in the match twice while he wasn’t tagged in, being held back by his partner. When he was tagged in however, he wrecked though both Pure Breed members and even used his partner as an object in one of his moves. However after this manoeuvre failed, he started to viciously attack him for no real reason. As the ref tried stopping him, he also got attacked for his trouble, getting him and Callum disqualified. The most unnerving sight was Cambridge screaming for help as his partners were being attacked and getting ring crew to try and stop the mad Prince, only for them to get taken out also. Awatar came out looking even more of a force to be reckoned with as he did when he entered, and it really was something, that’s for sure. Main Event: All Wales Championship. Much like the previous two matches after intermission, or really any match from this show, the main event did not disappoint. After starting off with an ambush attack from the champ Grizzly to Boar while he was entering the ring, it was as rough as you’d expect from both of these two. With a little bit of fighting on the outside on the guardrails, it only got more aggressive inside the ring as the match carried on throughout the night. It really seemed like either man could have won this match. Towards the end, the ref took an unfortunate bump and this lead to Grizzly trying to use his championship title as a weapon on Boar. He was unsuccessful after he was lifted onto the shoulders of Wild Boar; very impressive might I have to say, and managed to slam him down. Wild Boar also thought about taking Grizzly’s approach and used the title as a weapon while the ref was still down. But after some thought, he decided not to, which may have cost him more than anything as Big Grizzly soon retained the championship after hitting a Pop-Up Power-bomb for the pin fall victory. After the match, grizzly still wasn’t satisfied with his win so he attacked Boar some more before the new Number 1 Contender, Scotty Essex, came down to chase the champion off. He also had some words for him as he told those in attendance of his battles with bullying and depression through his life and how people like Grizzly are the reason he has had such bad experiences, to which Grizzly didn’t really care and mocked Scotty from outside the ring. He then vowed to end his reign as champion at the next show taking place in November. He then shook Boar’s hand after checking on him again and that’s all there is to it. Another Dragon Pro show finished. I know I may have rambled on a little too much during this one, but I wanted to do my best to talk about the key moments from the show that were absolutely worth sharing with anyone. I mean if you like things like seeing women drop-kicked in the head or panda masked high fliers nearly breaking their legs, then this might be your show – that came out pretty bad, I?m so sorry, I’m really sorry. But still, it’s worth coming to shows like this because, well, it’s worth it, take my word on it! And no I’m not saying that because I’m currently training with these wonderful people myself. It’s just fun! Independent shows are fun. And Dragon Pro is fun. With bigger and better things coming up in the future (at least I hope so), it would a pretty good time to look them up and see what they get up to. 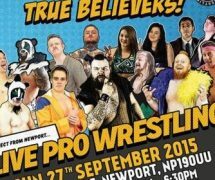 Their next show will also be something to keep an eye out for as it will crown the Dragon Pro Wrestling 2015 Rookie of the Year! Who will be etched into the history books alongside past winners like Mark Andrews, Wild Boar and Ian Williams? Well, you’ll have to keep up with the Dragon Pro social media places to find out more on those, or better yet, come to the show when it gets announced. So until then though, I guess that’s it for me. Hopefully I’ll get to do this again for you all real soon.